If you love the drama and wonder of green walls but have never experienced one in real life, don't miss your chance to see Patrick Blanc's dazzling display of living tapestries created for the New York Botanical Garden's 10th Annual Orchid Show (it ends this weekend!). The annual Orchid Show already inspires an enthusiasm akin to mania amongst orchid-lovers, but for their 10th year, they really wanted to blow people away botanically. So they sought out the help of Patrick Blanc, a botanist who has created some of the world's most jaw-dropping vertical garden installations. With the Enid A. Haupt Conservatory as his canvas and flora as his medium, Blanc painted a tropical wonderland, lacing archways, walls and even a breathtaking "green cube" with 7,000 luscious orchids. If you can't make it to the show before it ends on April 22, you can click through the vibrant photos we snapped to see everything you'll be missing, but you really have no excuse since Inhabitat readers get 20% off admission (keep reading for the details). And if you need even more coaxing, one of the NYBG's gardeners told us that even Sigourney Weaver stopped by to marvel at the magical gardens. Did you know that some orchids hang off of trees and don’t need to be planted? Their thick exposed roots gather all of the water they need right out of the air. For this year’s Orchid Show, the New York Botanical Garden came to life with a breathtaking series of green walls and vertical gardens designed by Patrick Blanc. Blanc, world-renowned for his gravity-defying vegetated facades, transformed the glass-enclosed Enid A. Haupt Conservatory into a dazzling spectacle of verdant facades that celebrate the colors and textures of the orchid. Upon stepping into the conservatory, visitors can expect to see a towering waterfall wall dripping with orchids and ferns. “The plants all grew so much since the show started,” explained Deborah Wetzel, Director of PR at the New York Botanical Gardens. Because they are so perfectly manicured, you almost forget that these gorgeous flowers are all still alive and growing, even while perched in their seeming precarious vertical positions. Showgoers can then go on to see three more lush walls (in pink, orange and white color palettes) planted with all manner of orchids, ferns, heather, medinilla, moss, vines, violets and more. Remember to stop and admire the planted archway (also a vertical garden) as you pass through it to get to the pièce de résistance, Blanc’s green cube comprised of four 13 foot planted walls. Each side is splashed with a different pattern of foliage and flowers, making it quite a sight to behold and step inside of. We hope you enjoyed our mini tour of the show, but if you’re in the New York area, we strongly urge you to visit for yourself, especially since Inhabitat readers can get 20% off of admission by purchasing tickets online and using the discount code 9036. Please note that the code is valid for All-Garden Pass tickets (purchased online only – it is NOT applicable for purchasing tickets at the garden) for visits through April 22. The NYBG is also hosting their last Orchid Evening this Saturday. Orchid Evenings are an alternative way for you and your special someone to take a romantic stroll through the Orchid Show at night. The ticket price includes a complimentary cocktail and we were told that three proposals have already taken place right in the conservatory during these events so if you’re planning a magical evening, this sounds like the perfect venue. Did you know that some orchids just hang off of trees and don't need to be planted? Their thick exposed roots gather all of the water they need right out of the air. For this year's Orchid Show, the New York Botanical Garden came to life with a breathtaking series of green walls and vertical gardens designed by Patrick Blanc. Blanc, world-renowned for his gravity-defying vegetated facades, transformed the glass-enclosed Enid A. Haupt Conservatory into a dazzling spectacle of verdant facades that celebrate the colors and textures of the orchid. Upon stepping into the conservatory, visitors can expect to see a towering waterfall wall dripping with orchids and ferns. "The plants all grew so much since the show started," explained Deborah Wetzel, Director of PR at the New York Botanical Gardens. Because they are so perfectly manicured, you almost forget that these gorgeous flowers are all still alive and growing, even while perched in their seeming precarious vertical positions. 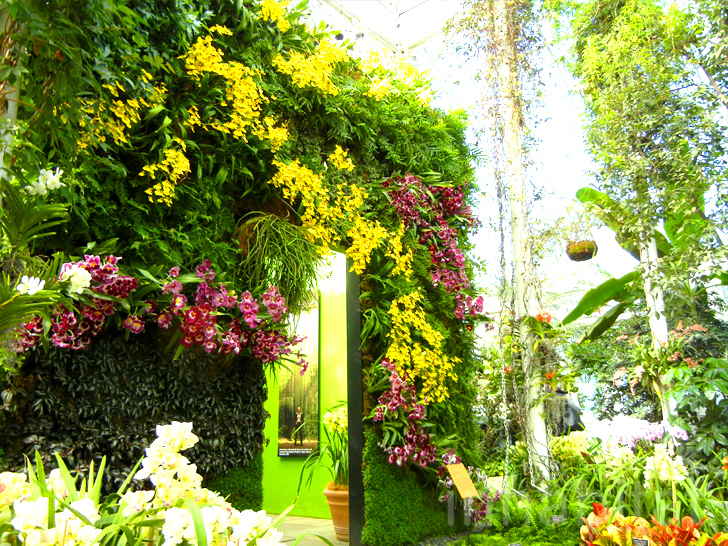 Showgoers can then go on to see three more lush walls (in pink, orange and white color palettes) planted with all manner of orchids, ferns, heather, medinilla, moss, vines, violets and more. Remember to stop and admire the planted archway (also a vertical garden) as you pass through it. The pièce de résistance of the show is Blanc's green cube comprised of four 13 foot planted walls. Each side is splashed with a different pattern of foliage and flowers, making it quite a sight to behold and step inside of. Another side of the cube. Inside the cube, you can view Blanc's intricate drawings showing his plans for previous vertical gardens. Upon closer inspection, you can see that each plant is rooted carefully in the walls. These photos really don't do these magical installations justice. The backside of the waterfall wall. When the installation started, the plants flanking the waterfall were just babies. Walls aren't the only cool configuration these orchids are displayed in. We hope you enjoyed our mini tour of the show, but if you're in the New York area, we strongly urge you to visit for yourself, especially since Inhabitat readers can get 20% off of admission by purchasing tickets online and using the discount code 9036. Please note that the code is valid for All-Garden Pass tickets (purchased online only – it is NOT applicable for purchasing tickets at the garden) for visits through April 22. The NYBG is also hosting their last Orchid Evening this Saturday. Orchid Evenings are an alternative way for you and your special someone to take a romantic stroll through the Orchid Show at night. The ticket price includes a complimentary cocktail and we were told that three proposals have already taken place right in the conservatory during these events so if you're planning a magical evening, this sounds like the perfect venue.